Boston Bruins fans do not need to be reminded about the great plays that Bobby Orr has provided the fan base in Bean Town. In the whole hockey world, for that matter. The Bruins defenseman beat St. Louis Blues goalie Glenn Hall from the lip of the crease just 40 seconds into overtime of Game 4 to complete the sweep and send fans at the old Boston Garden into a frenzy. You're getting goosebumps now, we know. What's even more interesting about remembering this great moment is seeing how Orr lived it. As the Legend explains in his new book "Bobby: My Story in Pictures," a photo differs from a memory. "It represents a single moment in time," Orr writes. "When you look at a picture, you might think at first that you’re just looking at a person, or maybe a place or some object. "But really, you’re looking at a time." You can see his full interview on the book and its release in the video above, atop of this article. In his new book out this week, Orr shares plenty of his own intimate moments in time, presenting pictures from his personal collection: there are "photos of his parents, pictures from his childhood growing up in Parry Sound, Ont., the start of his hockey career, his triumphs, heartbreaks, and life following a premature retirement at age 30 because of injury." "It was a fun process," Orr said in an interview with The Canadian Press this week. "A trip down memory lane. Seeing old friends, being able to put some of them in there was great." 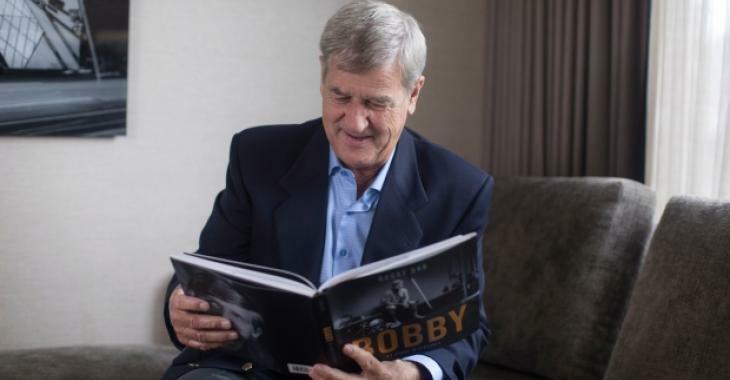 The 70-year-old Orr also wrote an autobiography titled "Orr: My Story," back in 2013, however, this new book gives readers the opportunity to experience what shaped him through pictures. There’s the picture of Orr and a Bruins teammate on the shoulders of wrestler Andre (The Giant) Roussimoff, another of the time he played golf with comedian Bob Hope, LPGA star Juli Inkster and former U.S. President Gerald Ford. You have to see it to believe it and you will be able to when you get your hands on his new book "Bobby: My Story in Pictures."